Oh, the hazards of living in a high rise. We spent Sunday evening at the emergency room; poor Little got her hand sucked into the wall with the elevator door. She's fine now but is sporting a very swollen, bruised little left hand. And I can just tell she's not her usual spunky self: she was even more cuddly (and crabby, and sleepy) than usual today, poor little sweetie. In each of the three x-rays that were taken at the ER, my hand was "posed" next to hers, either holding the same position to show her it was safe or to carefully keep her little fingers in position for the shot. They're probably rather amusing, and bony, photographs. I'd love to see them. When we returned home late at night our dinner was still waiting for us. I thought you might enjoy sharing it; call it a little celebration that the Kiddo's hand is ok. I make my own pizza crust, but you could just as well buy frozen or refrigerated dough at your grocer. Heat the oven to 425 degrees. Sprinkle a pizza pan or cookie sheet with cornmeal, or lightly grease the pan if you don't have cornmeal. Roll out the dough and place it on the pan. In a food processor or bowl, combine the beans, oil, cilantro, cumin, pepper sauce and garlic. Process or mash until smooth (or, if mashing, until you can't stand to mash any more). Spread the mixture over the crust. 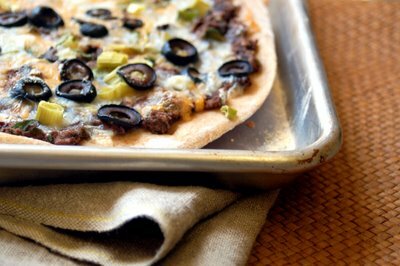 Sprinkle with the cheeses, olives, bell pepper and scallions. Then bake it for approximately 12-15 minutes or until the crust is golden brown and the cheese is melted. Serve it with the garnishes or just by itself. It's so delicious and healthy, and everyone to whom we've served it has absolutely loved it. Oh my goodness! I'm so glad she's okay...that must have been slow-motion scary! Lots of hugs and snuggles are just what the dr. ordered, for sure. Yikes - how horrible and frightening for all of you but I am glad that her hand is OK even if she is a little off colour - the upside more chances for cuddling. mmmm pizza - looks yummy. Oh my, what a scary experience! I'm glad that she's okay. That pizza looks absolutely delicious. I'm trying this recipe soon. so sorry you had an unfortunate elevator experience. hope she's recuperating ok! but that looks like a fab pizza, I'm so excited to try it. Think I may have to leave off the olives, though. Not much of an olive person. i hope that you are all doing well now. what a scare. the dinner looks quite good. im glad the little one is okay! I'm so sorry about your Tiny One! HI, Liesl, So sorry Little had to have that happen (my own little had that happen two months ago in a brand-new elevator at the Dutch Open Air Museum -- it's very, very scary!) and I will celebrate with you guys that she is fine (& parents, too). I'm printing off the pizza recipe -- thanks for sharing! Glad the hand is OK, so scary, I'm always terrified of that happening. The pizza sounds very interesting, I think we will have to give it a go soon. ñami pizza, your pizza looks great! That almost happened to my hand once in those dastardly fast elevator doors. I hope your hand feels better soon. See you next week? Delurking to say that I made your pizza and it was a hit! Thanks for the yummy recipe, and for giving me an idea for dinner. Hope that your babes owie is well by now also.